Scott Millett, "Professional ASP.NET Design Patterns"
Professional ASP.NET Design Patterns will show you how to implement design patterns in real ASP.NET applications by introducing you to the basic OOP skills needed to understand and interpret design patterns. 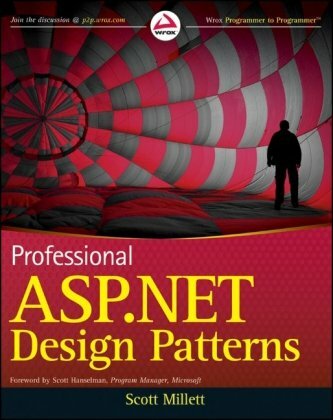 A sample application used throughout the book is an enterprise level ASP.NET website with multi–tiered, SOA design techniques that can be applied to your future ASP.NET projects. Read about each design pattern in detail, including how to interpret the UML design, how to implement it in ASP.NET, its importance for ASP.NET development, and how it’s integrated into the final project.